FluxLight's QSFP-40G-SR-BD is a Cisco® compatible 40GBase QSFP+ Optical Transceiver and is factory preprogrammed with all the necessary configuration data for seamless network integration. Our transceivers perform identically to Cisco® original transceivers and are 100% compatible with other OEM and third party transceivers. The Cisco QSFP-40G-SR-BD transceiver is 100% MSA (Multi-Source Agreement) compliant. All FluxLight's transceivers are tested for 100% functionality and guaranteed compatible for outstanding network performance. This application note presents a use case for a specialized QSFP+ 40G optical transceiver. The transceiver type is referred to as a 40GBASE-SR-BD, 40GBASE-SR-BX or 40GBASE-BIDI. What makes this transceiver special is, it is equipped with a LC Duplex optical connector and is specified for full-duplex 40GbE transmission over a single pair of OM3 fibers up to 100m or OM4 fiber up to 150m. 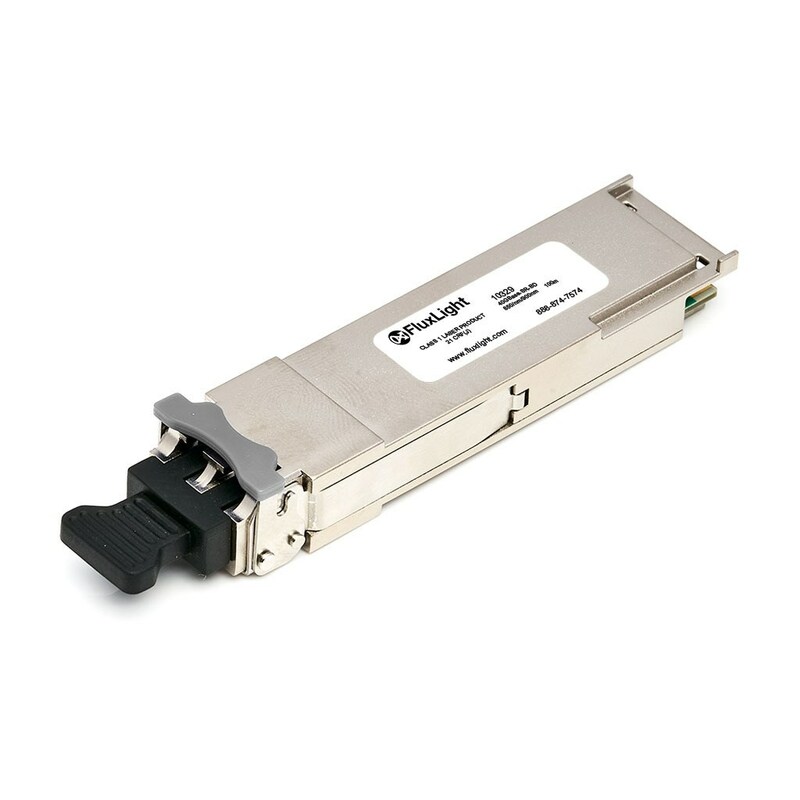 The more common Short Reach (SR) multimode QSFP+ optical transceiver, the 40GBASE-SR4 type, is equipped with an MPO/MPT connector and is specified for full-duplex transmission over up to 100m of OM3 multimode ribbon fiber (MPO-12, 8 fibers of which are used). The scenario explored in this application note is the effectiveness and ease of an upgrading an existing 10GbE duplex multimode link to 40GbE in situations where running new fiber is difficult or cost prohibitive. 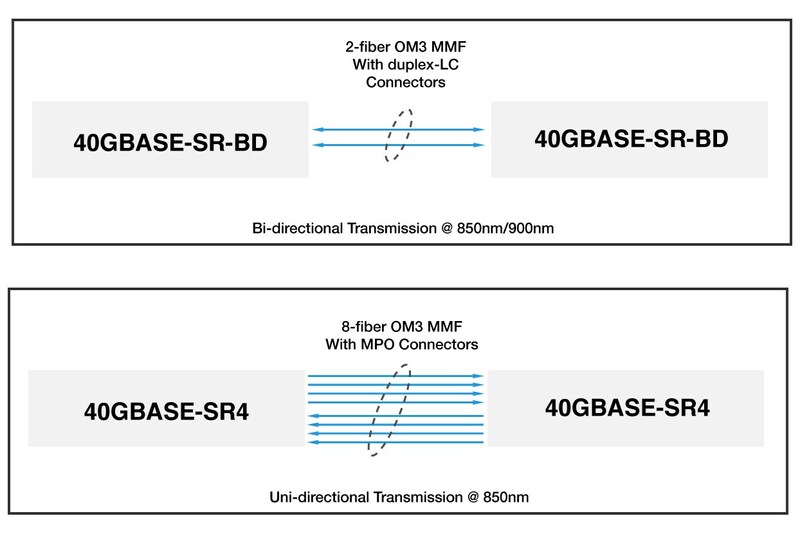 In such cases, the 40GBASE-SR4 cannot be considered because it requires installation of an 8-fiber ribbon MMF cable. For illustrative purposes two different brands of Ethernet switches, one designated a Spine switch and the other a Leaf switch are featured. In this scenario, previous switches, are being replaced by higher-capacity devices that are each equipped with QSFP+ ports. The existing switches were connected by 4 pairs of OM3 multimode fiber for a total full-duplex interconnect of 40Gbps. The new switches must interconnect at 40Gbps over those same 8 fibers for a new total of 160Gbps. The upgraded spine switch is a Cisco Nexus 9336PQ Switch and the leaf switch, an Extreme Networks X770-32q. The X770-32q, a part of Extreme Networks’ Summit line of switches, is positioned as a high-density TOR switch to support the latest generation of rack-mounted servers with 10GbE and 40GbE connections. This X770 switch supports Layer 2/3 low-latency cut-through switching. The X770 includes 32 QSFP+ ports all capable of full-line rate 40Gbps traffic with a corresponding 2.56 Tbps of switching bandwidth. All QSFP+ slots are 10G/40G dual-speed capable. A range of Copper and Fiber Direct Attached Cables are also supported by the X770. FluxLight’s QSFP-40G-SR-BD is a Cisco® compatible 40GBase SFP+ Optical Transceiver and is factory pre-programmed with all the necessary configuration data for seamless network integration. 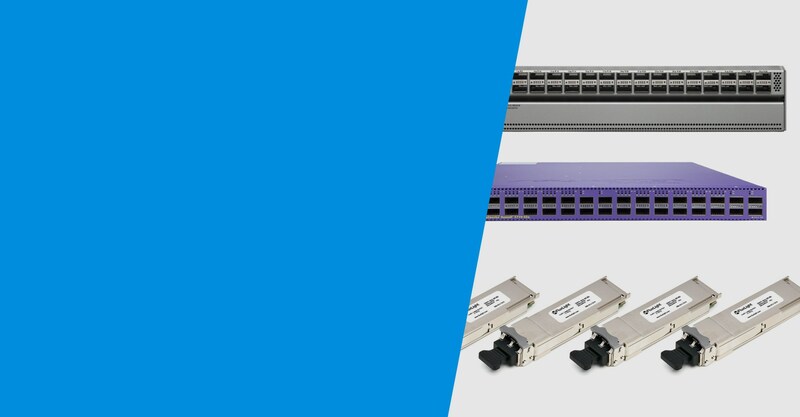 These transceivers perform identically to Cisco® original transceivers, are 100% compatible and support full hot swapping operation. The QSFP-40G-SR-BD is 100% MSA (Multi-Source Agreement) compliant. The 10329 SFP+ optical transceiver from FluxLight is 100% equivalent to the Extreme Networks’ transceiver of the same part number. It is fully compatible with the Extreme X770 switch described in this note. Like all FluxLight optical transceivers, both the 10329 and the QSFP-40G-SR-BD are backed by FluxLight’s limited lifetime warranty. Putting this upgrade together is relatively simple, thanks to the 40GBASE-SR-BD optical transceivers. The old 10GbE switches may be removed, if there is some use for them, space may be found nearby for the new switches. Once installed, four compatible optical transceivers from FluxLight are inserted. Each pair of OM3 cables, previously connecting at 10Gbps, are now connected to the QSFP+ 40GbE modules. Since its inception in 2004, Fluxlight has continually refined its processes to assure the best possible quality for our customers. The foundational elements of these processes are Record-Keeping and Quality Assurance Testing (QAT). To maintain a robust data archive, each part is individually serialized both in its internal EEPROM memory and on its external label. All QAT results and other important information (e.g., manufacture date, compatibility programming) are associated with each Serial Number stored in our cloud-based secure database. QAT consists of visual part inspection as well as verification of all critical parameters and performance of each part. For the QSFP-40G-SR-BD optical output power and wavelength (850nm/900nm) are verified on optical spectrum analyzers. Receiver sensitivity is verified at both minimum distance and the 100m maximum range over actual (not simulated) MMF , multimode fiber cable. Digital Diagnostics Monitoring (DDM) parameters including: optical output power, receive optical power, internal module temperature, transmit bias current and supply voltage, are tested for compliance with specifications.In addition, the part is verified for proper operation across its full operating temperature range, 0C to 50C.